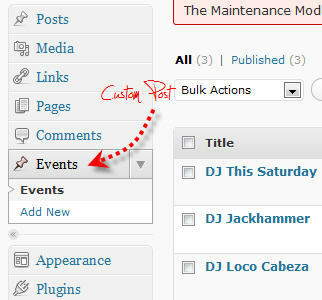 If you don’t know about WordPress 3.0’s new custom post types then you should… and I’ll tell you why! Before WordPress 3.0 there wasn’t an easy way to manage multiple post types. Custom Post Types are great for separating more specific post types such as real estate listings, events, galleries, and so much more. You can set up your own categories, tags, and create very in depth custom taxonomies. The following article is a resource for your to view some of the Internet’s best WordPress custom post type tutorials. I’ve reviewed and read each one and these are the one’s I think are worth your time! Please enjoy. The WordPress Community has been graciously sharing their knowledge with the world on the best ways to implement WP 3.0’s new custom post types… here’s a listing of the best tutorials I’ve found to date. This easy to follow overview starts with the basics of custom post types and walks the reader through to the creation of a “Super Duper” custom post type. This should help you get an understanding of how to implement a basic custom post type into your WordPress theme and provides good example of real life usage. Justin was on top of this tutorial as it was written before the official release of WordPress 3.0. Richard Shepherd’s article on Custom Post types is a very easy to follow and simple article that will explain the gist of WordPress’ new Custom Post Types. I really enjoyed how he laid down leading WordPress expert’s interpretations of Custom Post Types before his article to clear up what they are and how they are used. There’s a different in opinion from Chris Coyier (CSS guru) and Jane Wells (WP UX Pro) that sparks some good insight. Custom post types sound quite scary, but really they aren’t. This article provides some good reasoning as to why you would actually use WP’s Custom Post Types. As the article explains, allow your clients to add “Podcast” post without telling a gizillion ways to post it. It’s easier with Custom Post Types. As Developers we can provide our end users an easier way to use the WordPress backend to display the content they want to show.